Our driver/guide will take you to Arlington Cemetery, from there it is a walking tour with your own personal Licensed Tour Guide. Shuttle tickets are included on this tour. After the Tour we get back to our vehicle and drive to the Iwo Jima Memorial. Arlington National Cemetery is a United States military cemetery in Arlington County, Virginia, across the Potomac River from Washington, D.C., in whose 624 acres (253 ha) the dead of the nation's conflicts have been buried, beginning with the Civil War, as well as reinterred dead from earlier wars. 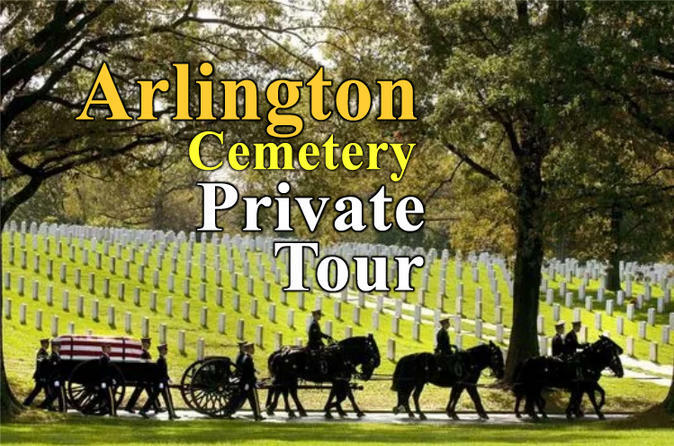 Visit Arlington Cemetery with your own personal Licensed Tour Guide (2 to 3 hour tour). This tour is a walking tour, although we include shuttle tickets if walking becomes too much. Some of the highlights include: John F Kennedy Grave site, Robert Kennedy, Ted Kennedy, Audie Murphy, USS Maine, The Tomb of the Unknowns, The Changing of the Guards, and more!